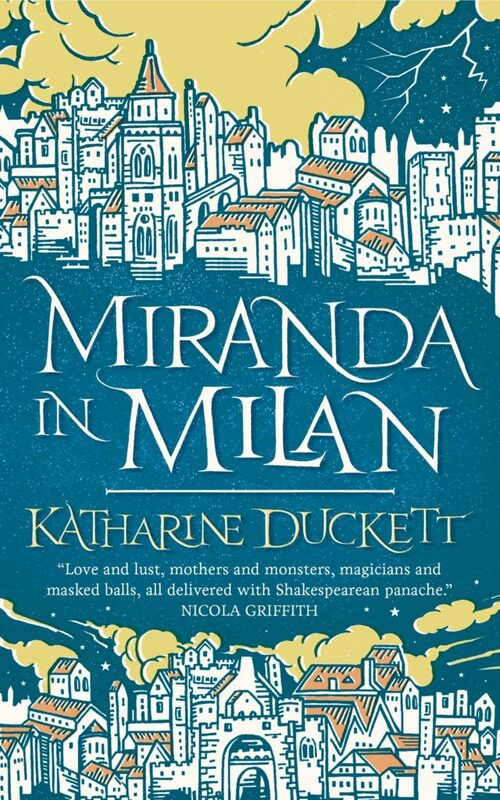 As someone who is a huge fan of Shakespeare re-imaginations, I knew Miranda in Milan had to be on my list. To take the perspective of Miranda was already worthy of my attention, but Duckett truly takes us on a journey. What happens to Miranda when she returns back to the mainland, and who will she become? (Disclaimer: I received this book from the publisher. This has not impacted my review which is unbiased and honest). So if you’ve ever wondered how Miranda would fare in society with backstabbing, politics, and even more secrets – look no further than Miranda in Milan. All the elements in “The Tempest” – the unfair treatment of Caliban, Prospero being a poor father, and the way Miranda is stifled – are discussed even without being on the island. And this time Miranda even has a confidante who will help her unravel this spider web. Prospero is a pretty terrible father, but we knew this before we even left the island. Not only was he cruel to Caliban and Ariel, but he is entirely self-absorbed. And what I loved about Miranda in Milan is that he’s not given a redemption. But the majority of Miranda in Milan is about how Miranda finally decodes all these lies about her life. It’s about Miranda uncovering the truth and taking back the narrative. There’s a tension, a feeling of wrongness at the pit of your stomach, and it only increases as the story continues. But Miranda is accompanied with the help of her clever and talented companion Dorothea. Through Dorothea, Miranda is able to see the wrongness of her life before. Not only with her father’s actions, but her own. How she treated Caliban and Ariel. While Miranda is the character that drew me to Miranda in Milan, Dorothea is the character who kept me there. Dorothea is clever, but she’s also having conversations with Miranda about how it hurts when her real name is mispronounced, or when people do not try to learn her language. Miranda in Milan is a story about Miranda rejecting the lies she’s been told by her father. The notion of her father’s identity, his history, and the past, has all been told to her by him. And in a world full of secrets and deception, Miranda has to realize that he may be the biggest deception of them all. It’s a story about power and ambition. About free will and respect. Find Miranda in Milan on Goodreads, Amazon, Indiebound & The Book Depository.